UPDATED: Thu., April 27, 2017, 10:54 p.m.
OLYMPIA – Washington’s edible marijuana products soon will be subject to the same oversight as other food. Licensed pot stores will be able to give away “lock boxes” so customers can keep products away from children. Industrial hemp is no longer an illegal drug in Washington. All three changes to state law were among bills Gov. 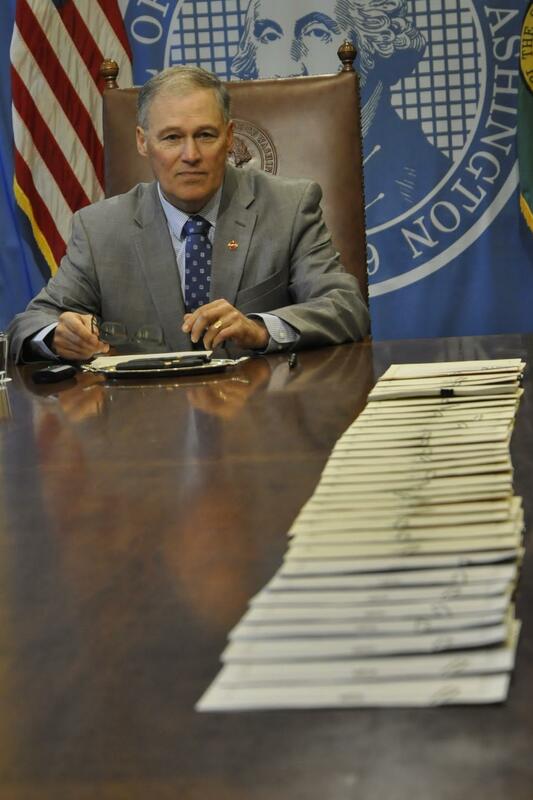 Jay Inslee signed Thursday. The lock box bill gives licensed marijuana stores an exemption to current law that bans them from selling anything other than marijuana products and from giving away items. That prevented the stores from accepting lockable storage boxes for marijuana products that some local health departments wanted to donate to the stores to give to customers. The lock boxes can be given to anyone who is at least 21, the legal age for using recreational marijuana, or to a registered medical marijuana patient who is at least 18. The stores can’t require a person requesting a box to buy something first. The new law related to edible marijuana products requires that any edibles a customer in a state-licensed store buys be inspected like other processed food for sale in Washington. The state Liquor and Cannabis Board has rules about how edible marijuana products can be packaged, which include details about potency and serving size, when it was manufactured, and a “best buy” date. It contracts with the Agricultural Department to do food safety inspections, but the department doesn’t have authority over marijuana producers, and those companies aren’t subject to the state’s Food Processing Act. That created what Inslee called a loophole in state law, which will begin to change in July when the process will be streamlined and the department given authority over marijuana-infused edibles just like other items covered by the Food Processing Act. Businesses that make edibles will have to get an endorsement from the department after passing an inspection when they renew their processor license with the board. The department will be able to suspend or revoke any processor’s license the same as it can any other food processor’s license. A third bill signed Thursday removed industrial hemp – a form of the cannabis plant with minuscule amounts of the chemical that produces the physical or mental effects of marijuana – from the state’s list of banned drugs. Even though it has no use as a drug, it was placed on the state’s Controlled Substance Act list because it is also on the federal Controlled Substance list. Last year, the state previously approved an industrial hemp research program for varieties of cannabis that are low in the chemical that produces the euphoric effects sought in recreational marijuana. Supporters say it could be a new cash crop for Washington’s farmers. The federal government also may remove hemp from the national list. The bill, sponsored by Rep. Matt Shea, R-Spokane Valley, passed the House and Senate unanimously. Inslee said industrial hemp has many important uses and the bill will protect farmers and processors. “This is another part of Washington’s responsible actions,” Inslee said. Like the other two laws, the industrial hemp law goes into effect in July. Published: April 27, 2017, 5:13 p.m. Updated: April 27, 2017, 10:54 p.m.